Each year we address the current concerns that girls are facing in terms of self-confidence, exploring tools for success, understanding parents, thinking about positive role models, and finding purpose and happiness in life. This program attracts 100 girls each year from grades 7 to 12 from Rockland County schools. All girls in grades 7 through 12 are welcome to attend and become more empowered! 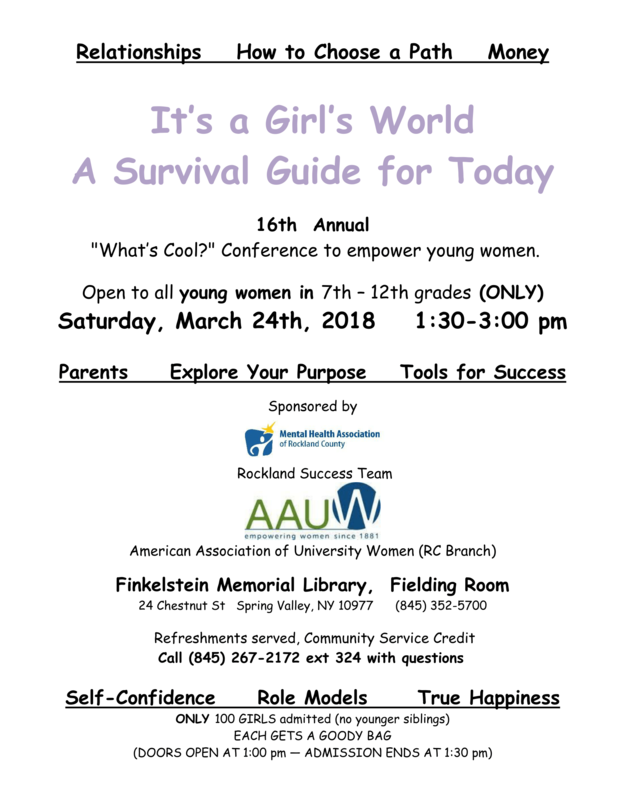 This year’s event will take place at the Finkelstein Library, Fielding Room at 24 Chestnut Street in Spring Valley NY on Saturday March 24, 2018 from 1:30 to 3 pm. Doors open at 1 pm and admission ends at 1:30 pm. We cannot admit younger siblings. Each girl receives refreshments, a goody bag and 2 hours of community service credit for college applications. If you have questions please call 845 267 2172 x324. 94% of our clients in Assertive Community Treatment (ACT) maintained stable housing. This outcome is particularly significant as individuals in ACT are at especially high risk of losing their housing due to complications from serious mental illness. 80% of individuals who graduated clean and sober from our Recovery Services program had been engaged with us for over six months. This statistic is crucial as data reveals that longer term engagement is the foundation for sustained recovery. More than 1,000 Rockland County community members received education and training from MHA staff on various behavioral health topics including suicide prevention, signs and symptoms of addiction, life-saving drug overdose interventions, and mental wellness. 2018 looks bright. We are embarking on new initiatives and projects that will continue to propel our mission driven services and strengthen the impact we have on those we serve. We are confident that our reach will expand, and that those who need us most will have greater access to our resources. This is all possible due to the remarkable work of our staff, Board, donors, and community partners. For this, we offer our appreciation and gratitude, looking forward with hope and inspiration.